We assume you’re running a free Linux OS Debian. Or find an old PC and install Linux. Lubuntu is running fine on a 1GB Pentium 4 or similar. Or make a VM. Whatever. But remember. If you’re using open standards and open source, you’re open to the world. First start by downloading the USBBoot utility. Follow the instructions to compile the program. Then download the latest Raspbian Stretch image to your download directory Downloads. Then you could burn the image to an USB flash drive, but we gonna do something clever, we gonna setup a loop device. Then we need two mountpoints for the boot and rootfs directories. Let’s create them. We’re creating them in the root folder, you could also mount them in your home-directory if you like, but remember there not writable, and are owned by root. So hence the choice for the /pi. Then we need the Raspberry Pi Zero to connect to the USB cable, and netboot Stretch. For that we need NFS mount.We have to set that up on the laptop and on the Pi. Install nfs-server on the laptop. Save and restart the NFS server. That’s done on the laptop. Now move to the pi Zero for the last parts. Edit config.txt in the boot directory (/pi/boot) to enable USB OTG mode and add some instructions to add initramfs. This will load extra kernel modules, so the Pi Zero can use the USB cable as an ethernet connection. Let’s explain this. 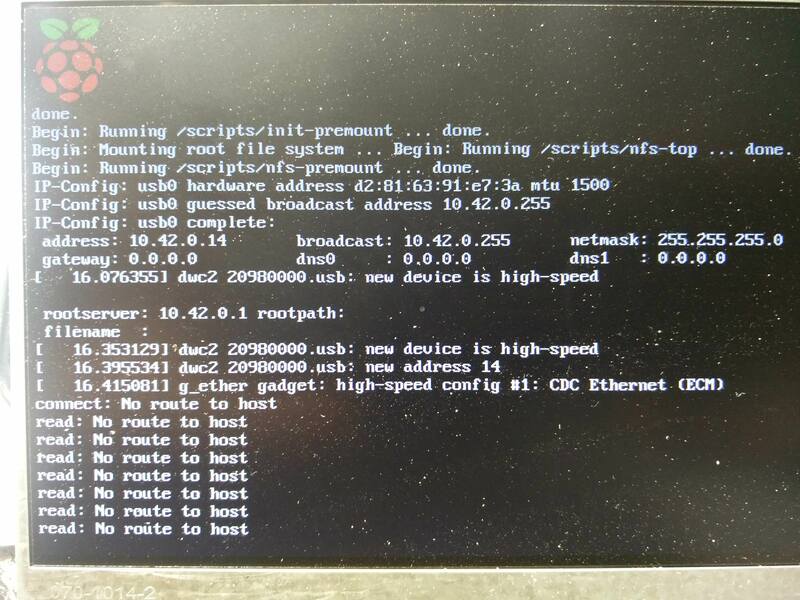 We need NFS mount (root=/dev/nfs), we set the network address (nfsroot=10.42.0.1:/pi/root rw) rw is read/write. We need the modules dwc2 ethernet gadget and g_ether and we set a a fixed ethernet MAC address to ease, and we set the network addresses. Remember Ubuntu/Linux will set USB networks on the 10.42.0.1 address range, and we give the pi the fixed address 10.42.0.14. Please read my other posts about setting up an USB connnecting with the pi Zero, if you need more information. Now we need to make a initramfs to supply some needed kernel modules. This is the best done on another Pi 1 or Pi Zero. We need to add the g_ether module and it dependencies in initramfs. First install the needed tools. Save and create the initramfs . It will be saved (initrd.img-4.9.80+ or newer) in the boot directory. Copy that file to the boot directory on your laptop: /pi/boot/, and name it initrd.img. As long it is the same name as in the config.txt file, it’s OK. Modify /pi/root/etc/fstab in the Pi root directory, and comment out (or delete) the last two lines. The Pi shouldn’t try to mount SD-card images anymore. Make sure you set the connection on shared. And your Pi Zero will boot, a bit slowly. Does your Pi connect to the internet? Yes, and actually quite fast! The Raspberry Pi Zero is really a 5 dollar computer in the end. No SD card, no keyboard, no monitor, no mouse needed. Just a Zero and an (old Phone) USB micro cable. All your changes will persist. The image in your directory will update. When you decide you need a SD card in the end, just flash the image to a SD card. This entry was posted on Thursday, March 22nd, 2018 at 6:21 pm	and is filed under raspberrypi, Webtechnology. You can follow any responses to this entry through the RSS 2.0 feed. You can leave a response, or trackback from your own site. Great, had some trouble to get it working, actually I connected a monitor on the Zero to debug the NFS settings, because it didn’t boot in the beginning. 2. Making a shared connection may need a bit more explaining. I had to resort to using fixed IPv4 address on laptop, and then had to use iptables to allow shared internet access, e.g. How to setup the Desktop side of network configuration. I followed the instructions but there is no usb0 detected on the Linux host. Am I missing something ? @Charlie. Now you mention it, yes, I changed some setting for SSH, which I forgot to document in this post. I will later. About the shared connection, I wrote two earlier post about it. Should have linked. Thanks for the feedback. @webonomic Can you share a working sd card image for this. I configured the static ip on both host and client image based on the previous guide and still i am unable to get it past kernel pannic. Is it necessary to compile initrd with the same kernel version or that is not strictly required to match? @Hex, I would definitely recommend to compile initrd with the same kernel version. I stumbled also on kernel panic errors, while finding all out. In what stage do you get the panic error? – Does it start NFS? My guess: the initrd. BTW crosscompile should be possible, I’ve that done for the pi, but haven’t tried it for initrd yet. @webonomics I compiled the initramfs again and got it working. The network is connected to PC but it gets stuck at no route to host. Hex, do you have any idea how you “got it working”? I appear to be having the same initial error as you. My zero is a v1.3, and my “computer” is a Pi3. The version of stretch on both is 2018-04-18. I’ve recompiled the initramfs a couple of times with no luck. I think I figured it out. ‘uname -r’ gives me the value 4.14.34-v7+ on my development machine. When doing the update-initramfs it needs for the the -k argument the string ‘4.14.34+’. My understanding is that the -v7 is for pi2/3 architectures, without is pi0/1 (and so needed here). @Jay. Great that you worked that out. Yes, you need to compile the initram on a Pi Zero or original Pi, or cross-compile. Sorry for the delay, The pre-mount error occurs if the kernel mismatches with the kernel version of the initramfs or if the network is not connecting the pi to the Linux system. One thing to note is follow the instruction to the letter and ensure firewall settings are set to ignore for usb0 on host computer. Let me know how it goes. I will check for your reply for some time. Once I figured out the cross-compile thing I was able to get there pretty much just by following the instructions. Thanks for the detailed and helpful descriptions. I’m thinking about trying to get the same functionality going using tiny core linux on the zero as a much lighter OS alternative that runs completely in ram. @Jay. Another approach, I followed, stripping away unneeded packages from a default mounted Raspbian Lite image, by simply uninstalling them from the pi Zero. (apt remove **). Remember, the mounted image is just a file on the harddisk, so it’s easy to copy, back-up and modify.`But tiny core will be much smaller. Hi, so I was able to build a piCore image that can boot over usb with usb ethernet gadget installed. To do that you’ll need to add the g_ether gadget to picore (see link http://forum.tinycorelinux.net/index.php?topic=20195.0 on how to do that), then you’ll need to start and configure it (modprobe dwc2 and g_ether and ifconfig the ethernet settings) at boot using bootlocal.sh, and lastly you’ll need to remaster the image (http://wiki.tinycorelinux.net/wiki:remastering) so that all the extensions/changes are in a single .gz file that can be loaded by usbboot (I didn’t need or want to get NFS going for the second file system). I did the first few steps on a SD card and then did the remastering before trying it out with usbboot. The boot time for the base piCore 9.0 system (on pi zero) over USB when customized this way was about 10 seconds. Until recently I’ve been testing this with a Pi Zero 1.3, and things have been working just fine. I’ve just tried it out on a Pi Zero W, and for whatever reason, the ethernet gadget isn’t seen by the connected system. Does anyone have experience with specifically one or the other board working? I’ve tried two 1.3’s and two W’s, and both 1.3’s work, but both W’s don’t. Strange. Begin: Running /scripts/nfs-premount … done. So I didn’t have luck with other attempts. I ended up making a dd copy of the SD card, and then added the usual to config.txt and cmdline.txt. Trying to narrow this one down now. My ifconfig looks like this after booting the zero. Only the bridge has an ip, and the zero gets 104, and access to my network. This is more like the way qemu gives a vm access. @ME, you make a good remark the symlink for ssh. How would I reboot the Pi zero from the host without physically unplugging it? I can unplug and re-run the usbboot, but I’d like to do this without restarting the host Pi or unplugging the Pi0. https://github.com/mvp/uhubctl can be used to interrupt power to the USB port, then you can run rpiboot again.